Elite Rapid Response First Aid Kit | BUDK.com - Knives & Swords At The Lowest Prices! 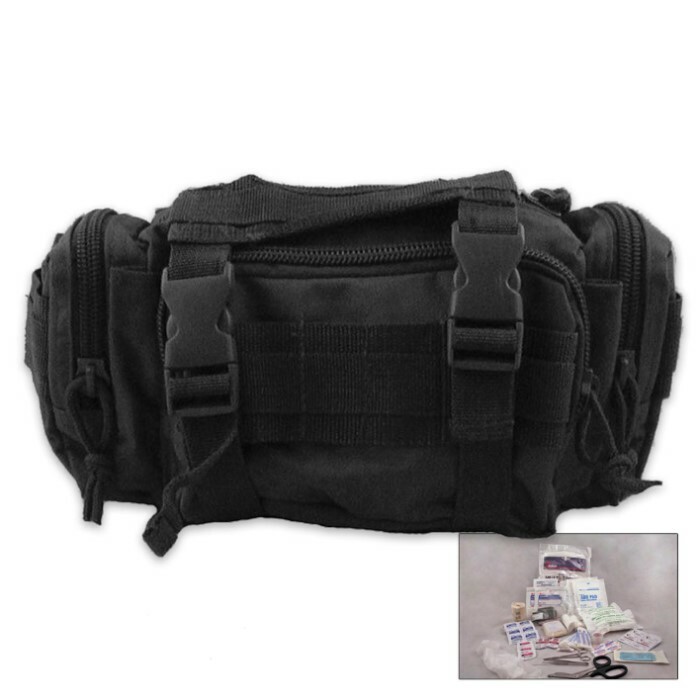 Measures: 11" x 6" x 6 1/2"
This rapid response bag was custom designed at the request of elite military units who were in need of a more compact, lightweight and conveniently portable kit for their daily field operations. The kit includes bandages, tape, adhesives, antiseptic agents, wipes, scissors, tweezers, safety pins, pain relievers, latex gloves, first aid creams, burn aid and skin and eye wash. The strong, canvas bag features multiple zippered pockets and MOLLE straps. Have a military grade first aid kit in your hands for those unavoidable emergencies. This little kit has quite a good bit of supplies in it and is definitely worth a look. With the M.O.L.L.E straps on it you can hook it to your plate carrier or your bag if you have the place for it. I guess the only concern would really be a resupply but I guess that is always a concern.